IQS Directory provides a comprehensive list of foam padding companies and suppliers. Use our website to review and source top foam padding companies with roll over ads and detailed product descriptions. Find foam padding companies that can design, engineer, and manufacture foam padding to your companies specifications. Then contact the foam padding companies through our quick and easy request for quote form. Website links, company profile, locations, phone, product videos and product information is provided for each company. Access customer reviews and keep up to date with product new articles. Whether you are looking for manufacturers of foam for cushions, foam padding for furniture, industrial, or customized foam padding of every type, this is the resource for you. Need foam padding for your products or business? You've come to the right place! We offer a huge variety of foam products for industries and businesses around the world. We have 9 distribution centers that can help you receive your products faster. Look to the foam experts to provide you with the supplies you need to make your goals happen. Contact us today to learn more! We offer the foam padding that you need for any industry. Foam padding is an essential part of so many pieces of equipment and products, and we realize that without quality padding, many products would break or fail. That is why we are as committed to quality as we are to our customer's happiness. If you need padding fast, look to the leaders in teh industry for quick assistance! Looking for quality foam padding at affordable prices? You've come to the right place! We are committed to offering the highest quality products to our customers, and we work hard to offer solutions to your problems combined with a large inventory and cost-effective pricing. We will work with you to create the ultimate designs and products for your needs. Look us up online for more info! Heubach Corporation brings some of the best laser die cutting the industry has seen. Whether you want your product in rolls, sheets or individual parts. We have the capabilities to cater to your specific needs. We strive to bring the best products and highest quality customer service out there. Foam padding comes in various shapes, styles, patterns, and materials. In the medical field padding is used for braces, wheelchair cushions, trays and transportation. In the personal safety industry padding is used for protection and can be found in goggles, backpacks, knee and elbow pads, inside of a helmet, or even a vest. The application for foam will determine the material that is used in the development and manufacturing period. Soft foams are used for comfort, and rigid foams are used for protection. Remington Products is a custom molder and fabricator of cushioning products. Technologies include compression molding, skiving & contouring, molded / poured urethane foams and elastomers, thermoforming, die cutting, laminating, decorating, packaging and distribution. ISO certified. Specializing in many industries, Clark Foam Products offers custom foam products using the latest technologies. Polyurethanes, crosslinks, filter foams, extrusions & more. Offering cost efficiency, quality & environmentalism with computer-designed products & innovative environmental technology. Here at Thrust Industries we provide die cut foam that comes in a variety of shapes and configurations. We die cut foam from a number of materials including: urethane, PVC, polyester, neoprene, ether, cellular, volara, and much more. If you would like customized die cut foam then please give us a call today! We offer all kinds of foam padding for every imaginable use and industry. We are dedicated to providing our customers with the tools and supplies they need to offer quality products to their customers. We believe in using the latest technology and highest quality materials to create products that are superior in ever way. Contact us by phone or email to learn more! One of the issues with foam products that has bothered environmentalists for years is the issue of recycling the foam. Foam, like many other plastic products, can take years to decompose. However, foam is highly recyclable, with the right facilities. Foam padding, such as the padding used in seat cushions and mattresses, can be transformed into other foam products, like carpet padding. Recycling foam can be an extra expense for a factory at first, but in the long run, it will save on the cost of manufacturing new foam products. Most old foam can be melted down and mixed with a few other ingredients to create foam that is just as strong as the original. This prevents the need for continuing to purchase new foam products, or manufacture additional foam from petroleum. A factory can end up saving money by reusing foam previously manufactured. Adding a recycling center to an existing foam factory is not difficult, and a company can even save additional money by charging a processing fee for recycling used foam products. Companies can charge a recycling fee to individuals who wish to drop off their old, unwanted foam products at the recycling center. This will cover the cost of recycling and save the factory even more money. Recycled foam can be used to make a variety of things, from additional padding to packaging material, to toys and novelty products and almost anything imaginable. Recycled foam is inexpensive and good for the environment at the same time. Foam is a lightweight, versatile, polymer based material used in a number of different industries and applications; one of its biggest applications is foam padding. Padding made from foam material can be used virtually for any industry or product that requires extra lining for protection or comfort. 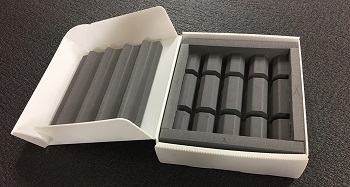 Foam padding is low-density flexible foam used in a wide range of applications such as upholstery, bedding, packaging, protective sports wear and more. Typical materials used in the fabrication of different types of foam include polyester, polyether, polystyrene, polyurethane, polyethylene and vinyl. Foam is described as open cell foam or closed cell foam depending on the arrangement of the material cells. Closed cell foam is made up of sealed and unbroken cells or bubbles that are in a tight configuration resulting in dense foam that provides a strong surface. Open cell foam is more flexible as the cells of the material are broken, or open. It is softer and less dense and is commonly used to make padding for a number of furniture applications such as barstools, carpets, benches and camping pads. Specific types of foam are chosen according to their different properties and according to the requirements of the application. Polyurethane foam is also referred to as PE, and is rigid foam constructed through an extrusion process. Beds, couches, chairs and other furniture all use PE as primary structural padding. 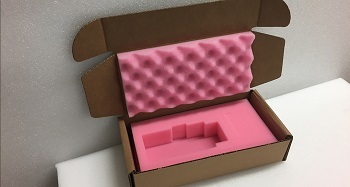 Polyethylene foam on the other hand is used widely in packing cases to provide support and protection for fragile goods. It is extremely lightweight and durable, and has excellent buoyancy. It is also used in a number of flotation devices and nautical equipment. Padding made from foam is lightweight, shatter proof and wear and tear resistant. It is easy to fabricate into the required shapes and dimensions for an application, and offers a cost-effective padding solution. It can also be used for insulation and to minimize effects of vibrations, in seals and gaskets, as elastomeric wheels and tires, for rotational transfer molding cores and expansion joint filler in masonry and concrete applications. Another advantage to using foam padding, especially closed cell foam padding, is that it is impervious to mold, moisture and bacterial growth and is able to be used in outdoor applications for a long time without breaking down or becoming unsanitary. The resistance of foam to absorbing water is a property which ensures its usefulness in applications such as medical foam or filter foam. Unlike other materials which may trap bacteria and water, closed cell foam resists it, thus preventing moisture build up and bacterial growth over time. Foam materials are easy to fabricate and can come in almost any size, thickness and shape. They can also be fabricated in a wide variety of colors.